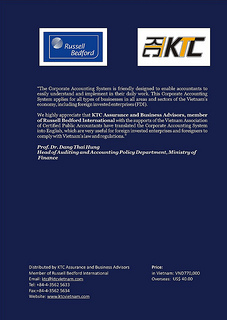 The Vietnamese Corporate Accounting System translated into English by Russell Bedford KTC is available for sales. The book was published nationwide by the Finance Publishing House. 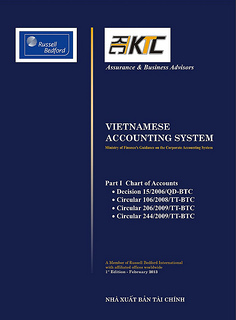 Being approved and assisted by the Department of Auditing and Accounting Policy of Ministry of Finance and the Vietnam Association of Certified Public Accountants (VACPA), Russell Bedford KTC, a full member of Russell Bedford International (“RBK”) made an unofficial English translation of the Vietnamese Corporate Accounting System – Decision 15/2006/QD-BTC (“the Decision 15”) and Circulars 106/2008/TT-BTC, 206/2009/TT-BTC and 244/2009/TT-BTC. Prof. Dr. Dang Thai Hung, Head of Auditing and Accounting Policy Department, Ministry of Finance highly appreciated RBK’s work and hoped that the translation will facilitate the Vietnam’s integration into the world economy. Mr. Bui Van Mai, Vice Chairman and Secretary of VACPA, who joined in the process of editing and publishing of the book, believed that the book will be very useful for businesses, organizations and foreigners who have been and will be investing in Vietnam. 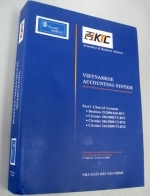 According to www.vacpa.org.vn the Vietnamese Accounting System is the comprehensive, detailed and clear guidance on the current Vietnam Accounting Standards. The lack of an English translation made FDI enterprises difficult in complying with the System. With the efforts and dedication of KTC Assurance and Business Advisors, the translation was available with the most updated regulations.This is a useful and limited-issue book. VACPA recommends the book to auditors and audit companies for your usage and your gift to clients. A/C Name: KTC SCS Audit Company Limited. 3. Cash payment: you are welcome to visit our office, chat with us and pay the book in cash.